Antenatal care is one of the most basic and effective methods to ensuring healthy pregnancies and preventing maternal mortality and morbidity. The World Health Organization currently recommends a minimum of four antenatal care visits, said Dr. A. Metin Gülmezoglu, coordinator of the Maternal and Perinatal Health and Preventing Unsafe Abortion Team, but this can be challenging and near impossible for some women in developing countries. “Seeing a sign on the road like that gives you the reason why we need to make sure we’re doing something to try and prevent this,” said Carrie Klima at the Wilson Center. Klima is the program director for the Centering Healthcare Institute, a non-profit that promotes an approach to antenatal health care premised on gathering women and health care providers together in a group setting and meeting on a regular basis to reinforce each other. She was joined by Faith Muigai, director of clinical operations at Jacaranda Health, a private chain of clinics based in Kenya, to discuss two different approaches to promoting antenatal care in low-resource settings on June 30. Many barriers prevent pregnant women from accessing antenatal care, including affordability, distance, time, education, cultural differences, and lack of facilities. But Muigai said the quality of care provided is just as important. A national mandate to provide free maternal care in public facilities has led to crowding and over-extended staff in many public clinics, compromising the quality of care provided, she said. To provide better service, Jacaranda focuses on specialized, quality care. Jacaranda’s typical client lives in a peri-urban setting and takes care of everyone in the household, “but has not set a minimum standard in terms of accessing quality services for herself,” said Muigai. Though they charge for services, Muigai said they work hard to make fees as low as possible, and being private allows them to provide a better experience. “It’s all about communicating quality in a way that’s meaningful to women,” she said. 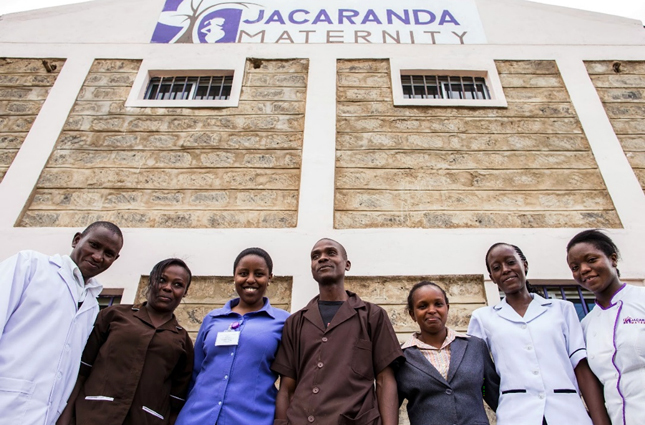 Jacaranda is able to pay staff better and invest in them, keeping them happier and giving them resources to provide the best possible care (a major problem in the maternal health field). Muigai explained that one of the first midwives she hired is now a clinic manager, a promotion that is exceedingly rare in similar settings elsewhere. They also analyze client satisfaction through surveys and build system efficiency by cutting down client wait time. Much like Muigai, Carrie Klima began her maternal health career in the United States before moving to Africa. The Centering model has provided group antenatal care to women in the United States since 1993 and now has hundreds of locations nationwide. The model revolves around the idea that “we are all meant to be in conversation,” said Klima, creating groups of mothers and care providers that meet on a regular basis, incorporating health care into community building and education, encouraging women to attend regularly, and building trust between patients and providers. After seeing the success of the model in the United States, the Centering Healthcare Institute wanted to test it in low-resource areas abroad. Klima said they consulted partners in Tanzania and Malawi and started pilot projects in both countries. The Centering model was well received by providers in Tanzania and Malawi who in the past struggled to treat large numbers of women over short periods of time. Instead of single appointments, they could now treat a group of women at once, thanks to the group model. Meanwhile, besides having regular check-ins with midwives, pregnant women picked up new information through the interactive learning sessions. For example in one village, when women learned how to interpret their own blood pressure, they were jubilant, said Klima. “Now I know what those numbers mean!” exclaimed one woman during a session. The Centering groups also did some myth-busting. Klima said some women were told previously there weren’t any treatments for sexually transmitted diseases or HIV so they opted not to go to health care facilities at all, when in fact there are. Though they had to make some adjustments for the low-resource settings – Centering reduced the U.S. standard of 10 antenatal care visit model to 4 in Tanzania and Malawi – Klima said she considers the pilots projects a success, especially given the enthusiastic feedback from patients and care providers. “We left Malawi with a renewed sense of knowing that not only is Centering Pregnancy feasible, but it’s acceptable.” Klima is going to Tanzania in August to conduct another pilot study. Though the Centering Pregnancy model and Jacaranda Health employ two very different approaches, the end goal is the same. “You want women to come earlier for care, [and] you want that care to mean something to them,” said Klima. The World Health Organization began a research project in April to better understand why women choose to receive or defer antenatal care services, explained Gülmezoglu. They hope to translate the results into better guidelines to improve efforts the world over. What seems clear is that the most sustainable solutions are developed locally, Gülmezoglu said, as exemplified by Jacaranda Health and the Centering Healthcare Institute. But there are barriers to such local ownership in many places. Low-resource settings tend to have a limited workforce, said Klima – “if we don’t address those shortages, there aren’t enough people to deliver the antenatal care.” In addition, more information on service integration is needed in areas where women have to travel to multiple facilities for care. “Often times if everything is in a different place, it can’t be efficient,” said Klima. Photo Credit: Jacaranda Health clinic, courtesy of Faith Muigai.